Oh! We saw The Young Victoria today. Harriet Walter is in it! Therefore, you didn't have to tell us twice to go see it. Of course, we loved it! Bonus: Harriet's role is much more than we expected. Plus it's about a British royal. Plus it's shot around Windsor, Kensington and Buckingham Palaces. 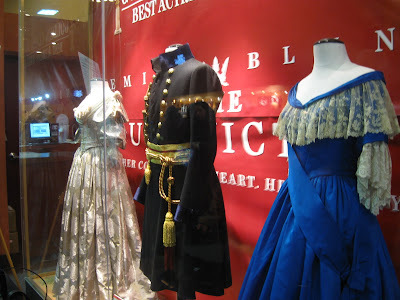 And, the costumes are simply sumptuous. 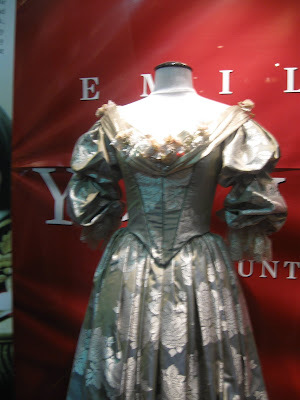 I snapped these photos of Emily Blunt's costumes down at the Chelsea Theatre a few weeks ago. She's so lovely in it. Rupert Friend is a heart throb. And, guess what? This movie is based on a true story! Be still my heart!